Thankfully since we don’t eat too much cheese, my fridge was stocked with 4 different kinds of cheese and the Feta, which I love :). Our evening snack is usually some oil free baked crackers with Feta and fruits. 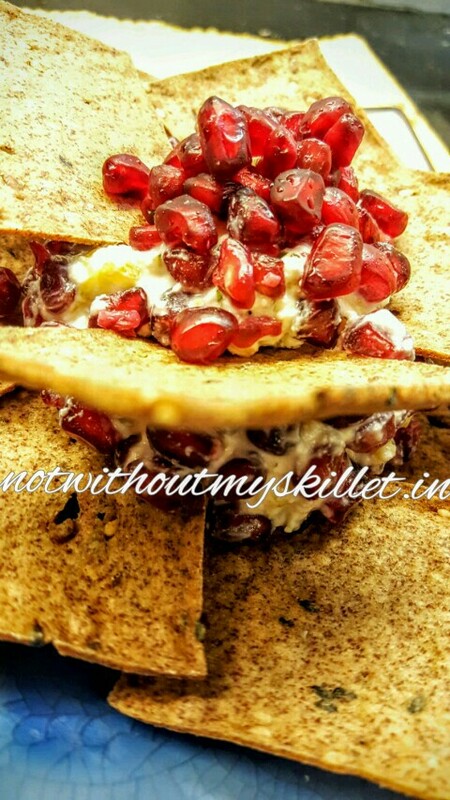 For this recipe, I’ve used the ragi or red millet crackers that were bought at a grocery store. 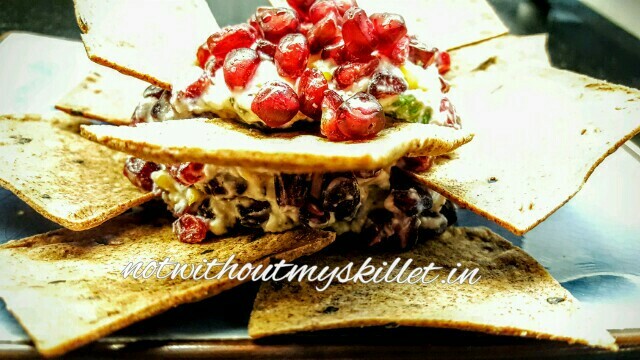 Thankfully eating healthy is in fashion and a wide variety of crackers is now available. 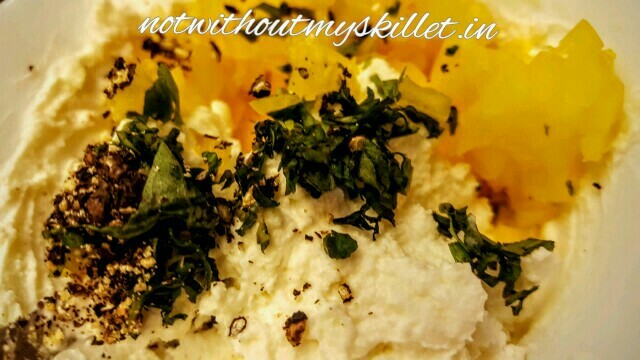 I love these ragi crackers, but you can use rice, oats or even lavash with this cheese ball. Sky is the limit to what you can achieve by mixing a couple of ingredients together. 1. Combine the three cheeses and other ingredients (except the pomegranate) together into a ball. I was working next to a hot oven, which is not the best place to bring the cheese ball together. Use a cooler part of your kitchen. 2. 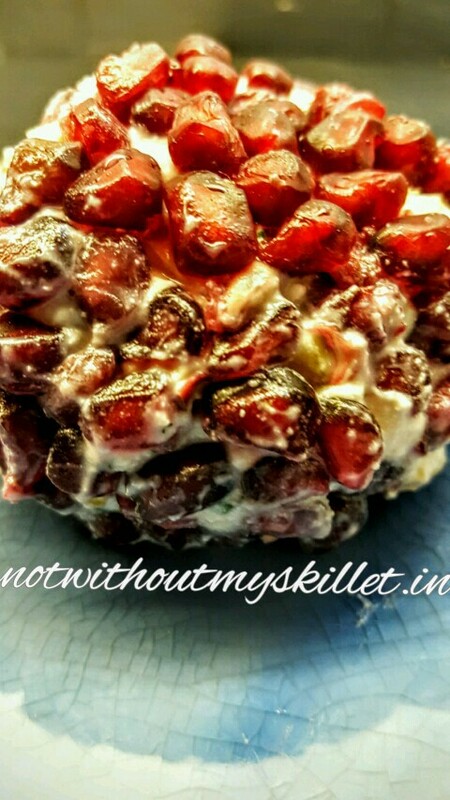 Place the pomegranate pearls on to a plastic wrap and then roll it around the cheese ball. If you have the time refrigerate it for 2 hours. It helps the cheese ball bind better. 3. Unwrap it and place it on a plate. 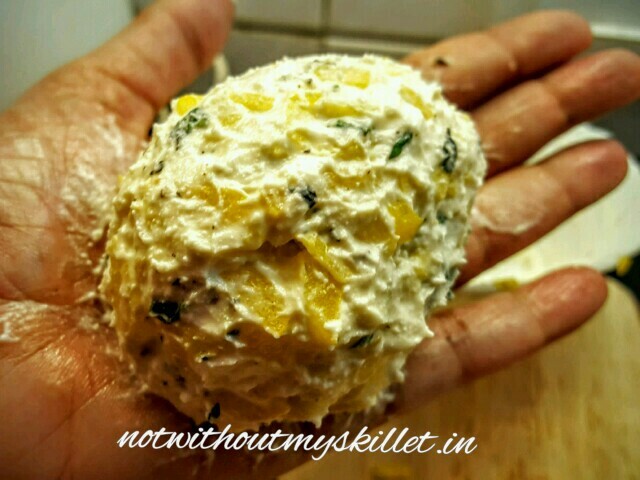 You can serve it with crackers around the plate or inset some into the cheese ball like I did.